New research from Prudential has found that couples in the UK are happy to talk about their money, but struggle to turn these conversations into concrete financial plans for the future. The annual survey, analysing attitudes to money and retirement planning among co-habiting couples aged 40 and over, found that nearly four in five couples (79 per cent) have discussed their finances in the last year, but more than half (52 per cent) admit that these conversations haven’t led to them agreeing a target figure for their joint retirement incomes. 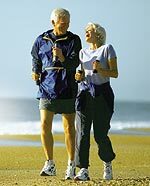 This figure rose to more than two thirds (67 per cent) among couples aged 45 to 54 – the crucial years in the lead-up to retirement. This failure to turn conversations about money into actual plans for the future is further demonstrated by the fact that although nearly three fifths (61 per cent) of couples over the age of 40 have discussed retirement planning in the last year, one in five (18 per cent) still admit to not knowing where their main source of retirement income will come from. Even more worrying is the fact that a quarter (25 per cent) of couples over the age of 40 have retirement funds that will only provide an income for life to an individual – rather than to their partners as well. Prudential’s research took place six months after the Chancellor of the Exchequer announced sweeping changes to pensions, savings and retirement income choices in the 2014 Budget. Three-quarters (74 per cent) of couples over the age of 40 said that they are aware of the changes, and 29 per cent of them have discussed the implications with their partners. However, despite this apparent awareness of the choices and opportunities now facing savers and retirees, only one in five (20 per cent) couples over the age of 40 say that one or both of them has consulted a financial adviser in the last five years, and only one in 10 (nine per cent) have had a joint meeting with their spouse and a professional adviser or retirement specialist. Meanwhile, the vast majority (70 per cent) of couples have never seen a financial adviser to discuss their retirement plans. Vince Smith-Hughes, retirement expert at Prudential, commented: “The gulf between those who are aware of retirement issues and recently announced Budget changes, and those who discuss the implications openly with their other halves is alarming. However, simply having conversations about money is not enough. Taking action always needs to be the next step. “For many couples, the first step to agreeing and securing a target income in retirement should be seeking professional financial advice together. As retirement becomes a more immediate prospect, a professional adviser or retirement specialist can help couples to make the right decisions about generating an income in retirement. Donna Dawson, psychologist and relationship expert says: “Although money appears to be a straightforward black and white issue about numbers, it is actually a very complex and emotional subject. Money discussions can often lead to disagreements between couples – misunderstandings, sulky silences and angry rows.